Scientists at the Smithsonian Institution and partners have published a paper that optimizes sperm collection protocols from the critically endangered Panamanian Golden Frog Atelopus zeteki. It also improves our understanding of reproduction in endangered harlequin frogs. The research, to be published published 15 March 2017, in Theriogenology, was conducted by Dr. Gina DellaTogna, a Panamanian biologist who studied this charismatic animal at the National Zoological Park in Washington DC. The study characterizes the dose-response patterns for several artificial hormone treatments and describes the sperm morphology for the first time in this species. The research is particularly relevant to current amphibian conservation efforts in Panama where the Panama Amphibian Rescue and Conservation Project has captive-breeding colonies of five species of Atelopus that are threatened with extinction from the deadly fungal disease chytridiomycosis. “Successful reproduction is key to any captive assurance program,” said Roberto Ibáñez, the director of the Panama Amphibian Rescue and Conservation project at the Smithsonian Tropical Research Institute in Panama. “Gina has already begun applying what she has learned to successfully help us to produce offspring from four other endangered harlequin frog species. I hope that she will eventually extend it to species with different modes of reproduction that are also difficult to breed”. The research was made possible with assistance from the Maryland Zoo in Baltimore who manage the Golden Frog Species Survival Plan. 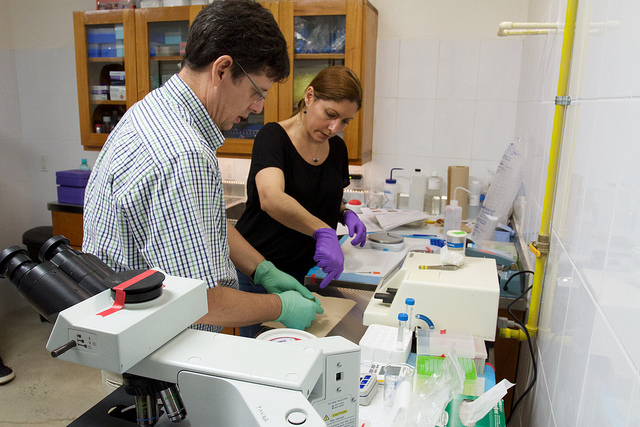 Funding was provided from the Panamanian Government’s Secretaría Nacional de Ciencia y Tecnología (SENACYT), The WoodTiger Fund, the Smithsonian Endowment for Science and the University of Ottawa Research Chairs Program. This entry was posted in ex-situ conservation, Golden frog, Research by admin. Bookmark the permalink.